In addition to the GoZync framework itself, GoZync ships with two sample files. In the "Local" folder, you'll find "QuickContact.fmp12". This file will eventually be the remote file on your iPad. In the folder "Host" you'll see "QuickContact Hosted.fmp12" which is the hosted version of the solution, the file in which your data will end up. Using these two sample files, you can start playing with GoZync and see how it works before you integrate it into your workflow. These sample files are for basic usage, such as jotting down contacts you meet at a trade show. You can enter some brief details about the contact and associate a photo with them. You can then Zync this info back to your server, using QuickContact to aggregate the contacts made by a number of your employees. You'll need to enter your license into GoZyncLicense.fmp12 (in the Hosts folder) before you can start using GoZync. Before implementing remote Zync, you can use GoZync locally to see how it works. 1. 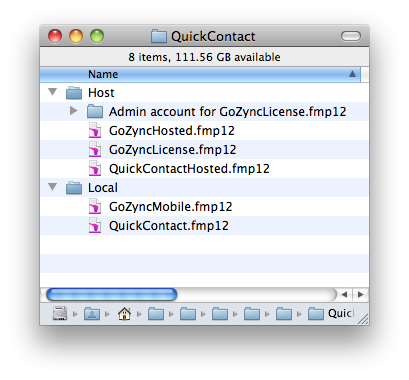 Open all the FileMaker files in the Host and Local folder and navigate to QuickContact.fmp12. You'll see some sample data there. The first screen is a list view. Click "new" at the top to make a new contact. When you're done, click the orange arrow to come back to this list view. You'll see that you're newly created contact isn't yet "uploaded". 2. Click "Zync" and GoZync will send that record to the host and pull down any new contacts. 3. Check out the hosted file, QuickContactHosted, and you'll see your new contact. Check out the Zync Log tab in GoZyncHosted and you'll see a description of what happened in that sync. That is the basic way GoZync works, though it is much more impressive when your local files are running in FileMaker Go. Next you'll likely want to host/serve the files in the Host folder. Replace "yourserver.com" with the name or IP address of your server. Now do the same with other other Data Source in GoZyncMobile, replacing the "yourserver.com" reference for QuickContactHosted with the same server name or ip address you used above. 4. At this point you can repeat the steps from "Playing with GoZync..." above, this time uploading contacts from your local copy of QuickContact.fmp12 to the served instance of QuickContactHosted. Now that you've pointed your copy of GoZyncMobile.fmp12 at your server, you're ready to place the mobile files on your iPad and see how GoZync really works. Once QuickContact.fmp12 is on your device, it can download new copies of itself, but you'll need to get it there manually the first time. To do this, open GoZyncHosted from your server and head to the Downloads tab. and You'll see an email icon right above the list of files: click that and email yourself: when receiving that email on your iOS devices, you can click on the link, open the hosted downloads layout in FileMaker Go, and click the "install" button to download both mobile files. Don't forget you need both QuickContact and GoZynMobile on your iOS device. Once QuickContact.fmp12 is on your device, you can resume the "Playing with GoZync..." steps at the start of this article, this time uploading contacts from your iPad's copy of QuickContact.fmp12 to the served instance of QuickContactHosted. Downloading Visit the home layout in QuickContact and click "Check for Updates". If this is your first time doing this, you should get a new version of the file (provided you've already synced your contacts).